Wie bereits vor kurzem im Artikel Fischer Fisch angekündigt, hat uns Leser Wolfgang gleich mehrere lustige Übersetzungen von Speisekarten zugeschickt. Heute wird es Zeit für den zweiten Teil des exotischen Übersetzungsversuche. 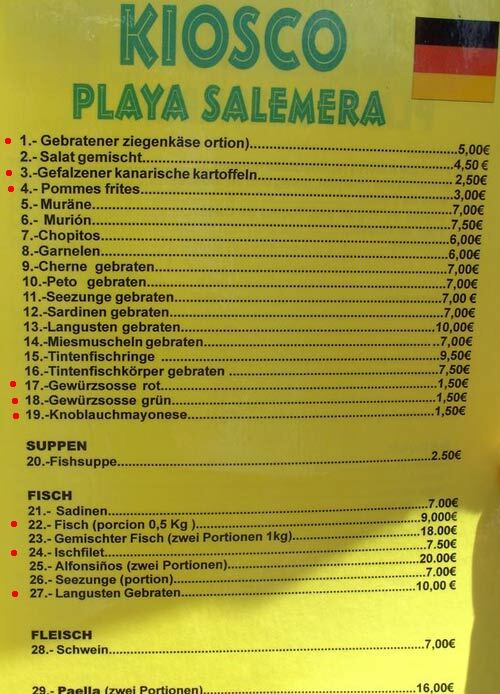 Die deutsche Flagge auf dem Menü des “KIOSCO PLAYA SALEMERA” hilft nur zum Teil, die Sprache der Speisekarte zu verstehen. Neben der teils abenteuerlichen Rechtschreibung, lustigen Tippfehlern und Auslassungen (wie die Nummer 24, das “Ischfilet”) gefallen mir auch die Sinn kaschierenden Schreibfehler wie zum Beispiel die Nummer 3, “Gefalzener kanarische kartoffeln” sehr gut. Hello! I could have sworn I’ve visited this blog before but after looking at many of the posts I realized it’s new to me. Nonetheless, I’m definitely delighted I found it and I’ll be book-marking it and checking back regularly! Hey! Someone in my Facebook group shared this site with us so I came to look it over. I’m definitely loving the information. I’m book-marking and will be tweeting this to my followers! Exceptional blog and brilliant design and style. TY for posting, it was very handy and told a lot. Can one reference a number of this on my page if I include a reference to this site? If you want to improve your familiarity only keep visiting this web site and be updated with the most up-to-date news posted here. 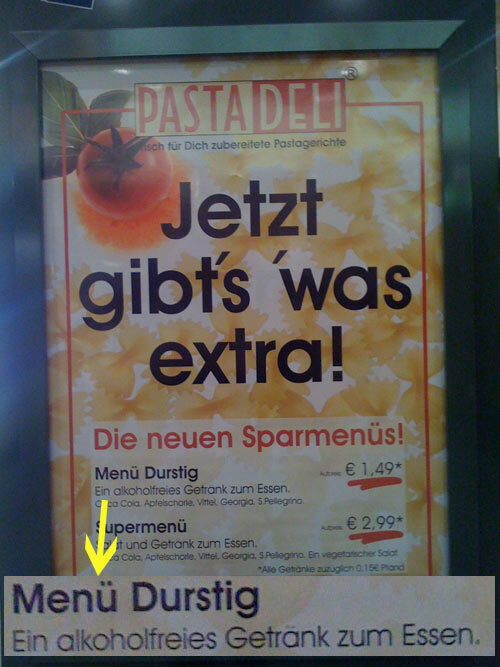 Na das nenne ich doch mal eine kullinarische Speisekarte. Sieht man auch nicht alle Tage. Habt echt eine lustige Seite mit den ganzen Schreibfehlern, die man machen kann. “Crackers!” said Dumbledore enthusiastically, offering the end of a large silver noisemaker to Snape, who took it reluctantly and tugged. With a bang like a gunshot, the cracker flew apart to reveal a large, pointed witchs hat topped with a stuffed vulture. Ji Xiaolan Ye looked at the appearance of worry, and my heart poured out a trace of complex emotions, got up and walked to the room. In it, the hand carrying a bucket, a look inside Ji Xiaolan, are placed in a bottle a bottle of wine on the cabinet. Staring down at the wadded shirts, Min was sure that she knew who was going to be doing all of Gareth Bryne’s laundry, and it was not Siuan Sanche. Rand bloody al’Thor. Fall in love with a man, and you ended up doing laundry, even if it did belong to another man. When she marched into the kitchen to demand a washtub and hot water, she was snarling every bit as much as Siuan. Xi and know that they can not find the owner of the voice, they will give up the search, his hands clasped together, bowed to the mont blanc pen price ground and worship Road.